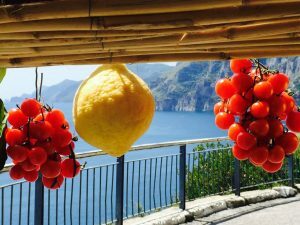 Enjoy the wonders of Capri with this private tour. You will visit Blue Grotto, Faraglioni and more with an exclusive experience! If you want to be a VIP for one day, this is the perfect tour for you! You will enjoy Capri Island with a luxury experience. Let’s discover the tour! 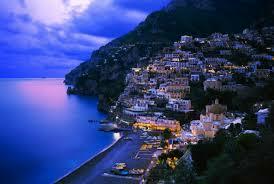 n the south side of the Gulf of Naples in the Campania region of Italy and it is famous for its caves. At first you will meet your personal guide at the port of Naples or Sorrento and cross to Capri by jetfoil. At your arrival in Marina Grande, a captain with a Gozzo boat waits for you with cocktails and towels to lead you around the island visiting the famous Grottos and the Faraglioni. An enchanting tour, in which the water changes its colours at each cave, reflecting a different shades, such as champagne, coral, emerald and the famous Blue. 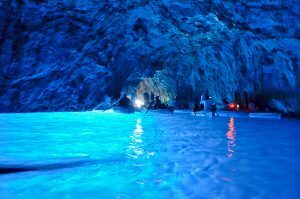 So Blue Grotto is the famous cave of the island and it is known for its intense Blue colour water. When you enter in the cave you will discover how small it is, so it can be visited only in weather is good. 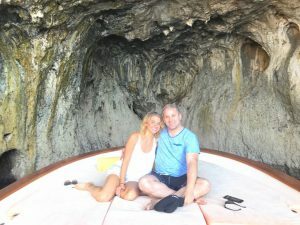 When you are in the cave, you should get off your boat and jump in a rowboat, the only boat size allowed to pass the magic bow that will take you in a enchanting world. So you will enjoy the fabulous blue water and the darkness, with a fantastic piped music singed by the Capreese sailors. Just some minutes for a jump in the water and then ride to the Faraglioni, island guardians, so enchanting to be the very icon of Capri in the world. Just a tip: if you kiss your lover passing under the “love arch” of Faraglione Stella, your love will be eternal. At the end of the boat tour, you will land on the solid ground and you will admire La Piazzetta and Via Camerelle, the luxury-shopping street. Here you could even meet VIPs having “Aperitivo” in one of the Cafés. At the end to get back to Marina Grande’s pier, you need to take the Funiculare, the cable railway surrounded by orange trees and facing the sea. So if you want to live an exclusive experience, this is the right choice! Discover the enchanting Ischia with a special tour. You will visit Ischia Ponte, Sant’Angelo and other place, tasting the typical Italian Food. Ischia is a volcanic island in the Tyrrhenian Sea and it lies at the northern end of the Gulf of Naples. 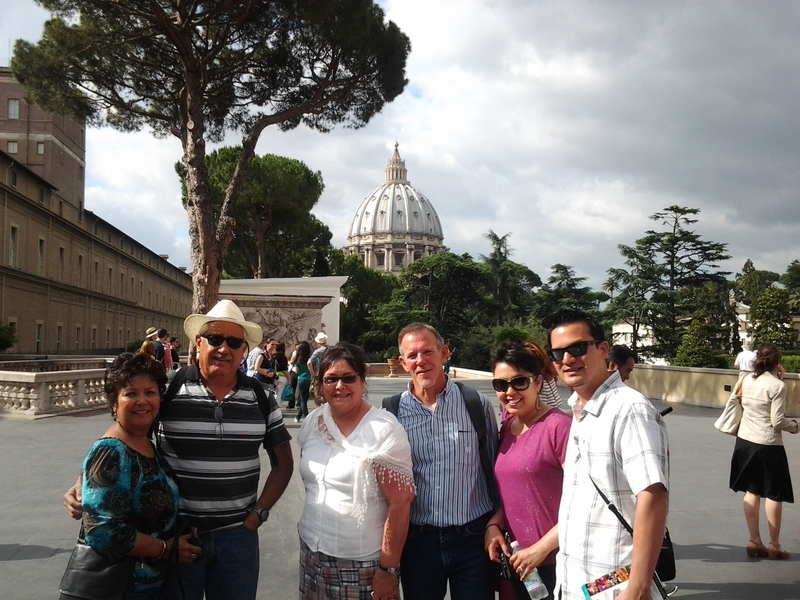 With this tour you will visit the island in a journey through places and food. Let’s discover the tour! 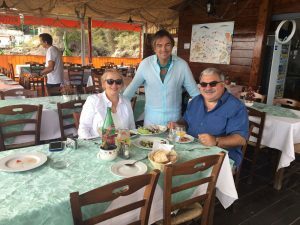 You will meet your guide at the port of Naples or Sorrento for this full day tour of Ischia and you will take you to see the best of the island and taste the local food. At your arrival at port, you will be welcomed by a typical breakfast at Bar Calise. There you have to taste the mythical Sfogliatella, the most famous pastry of the area. Made with a cream of sugar and ricotta cheese in a puff pastry. From Bar Calise you will move from Ischia Porto to Ischia Ponte, to find the Aragon Castle. The ancient building lies on a volcanic isle connected to Ischia by a bridge and it represents the symbol of the island. Visiting the narrow lanes of Ischia Ponte, you can admire the beautiful beach of Cartaromana and stop to take a break at the Fruit stand for a juice with fresh seasonal fruits. 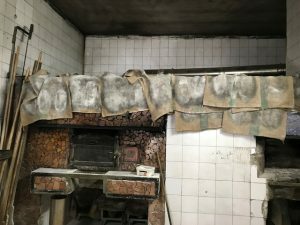 Your next stop will be at the most famous Salumeria of the island to taste a “Panino con mortadella”. 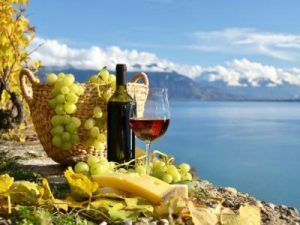 Then you will discover the borough of Fontana, the highest village of the island and there you will taste Pasta and local wine glass. Its particularity is the spectacular view on the enchanting panorama. under the sea level, creating natural thermal baths, famous in the area! There you will taste a glass of Vin Santo and then, your driver and guide will leave you at the port, where you will take the jetfoil back to Sorrento or Naples. Italy is full of art and unique buildings different in style and ages. You can feel in the glorious past in each city you are going to visit. What you should know is that this “boot”peninsula is also rich of natural beauty, hidden gems to explore. If your trip includes some days in Sorrento or Naples you cannot miss this relaxing experience in Ischia! 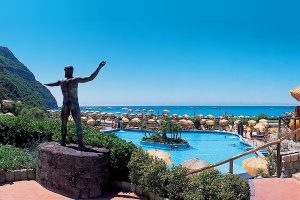 Known to be the largest Island in the gulf of Naples and home of Emperors, Kings and noblewomen over the centuries, the island has volcanic origins and the activity of volcanoes makes it destination of beauty and Wellness. You can find natural thermal baths in many hotels and Thermal Park all over the island. 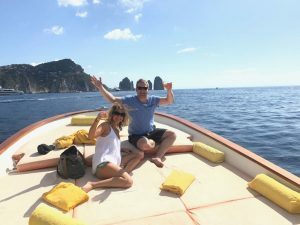 The private day trip starts at the port of Naples or Sorrento, where one of our staff meets you at and helps you to manage with tickets and embarkation on the jetfoil to Ischia. 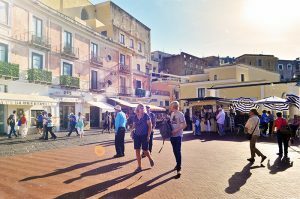 At the pier of Ischia Porto, a local English speaking driver will wait for you to start a car sightseeing tour around the Island up to the Negombo or Poseidon thermal Parks. 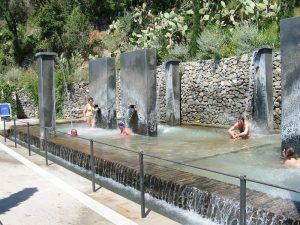 The two biggest parks of the island are plenty of pools with thermal water from 10 to 45 c°. You can enjoy a massage therapy or a mud treatment, which makes you regenerated to continue your trip around Italy! 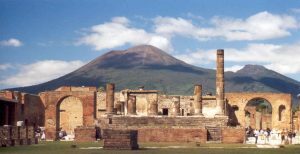 Pompeii is the largest and most famous excavated ancient city in the world. In 79 AD Mount Vesuvius exploded and the eruption covered the city with a thick layer of ashes that preserved frescoes and walls intact for centuries. 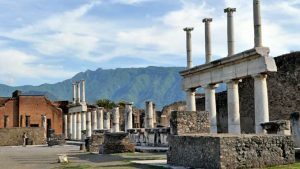 Our guide will take you to the most interesting sites of Pompeii making you save energy and time while explaining in details the places you visit. You will climb the steps and seat in the Ancient theatre, walk down the main shopping roads, explore the restaurants, the mills, the warehouses, the pleasure houses. We will enter the Ancient thermal baths still covered with colorful mosaics and paintings. We will visit the rich mansions of the wealthy class, lavishly decorated. You will feel like jumping back in time to the I century AD and you will learn so much about people’s Ancient way of living and history. 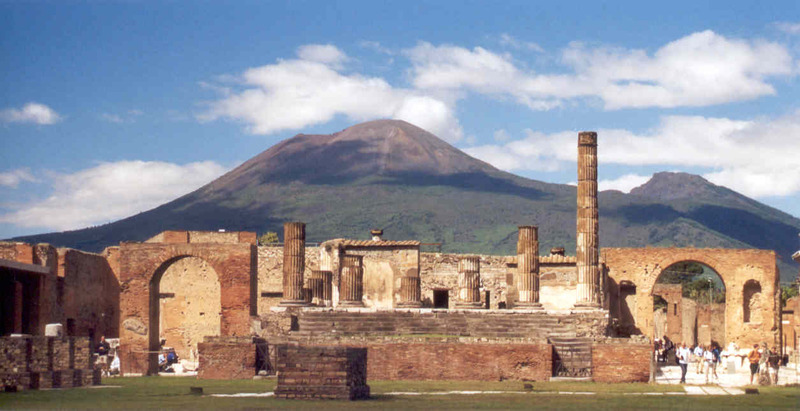 You must visit Pompeii at least once in your life.